Now I'm not religious ... at all. 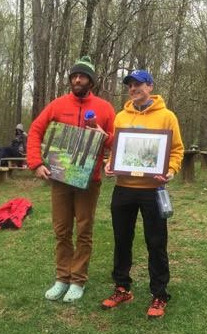 But the notion of a Promised Land was not lost on me as I found my self traversing the Blue Ridge Mountains of David Horton's Promise Land 50K. ... oh, what's that? You're wondering, what the hell is Rapunzel doing in this race report?! Well, I could opine about how the lyrics to the song When Will My Life Begin in the 2010 Disney instant classic Tangled embody the pure joy I feel when I'm traversing mountain single-track. But, really, this obnoxious song just so happened to be THE song stuck in my head during Promise Land (for those interested, Winnie the Pooh's The Rain Rain Rain Came Down Down Down drove me crazy for the 7+ hours of Bull Run). Why? How? Well, I've got a 2 year old daughter. That should be explanation enough. It's better than Let It Go, I suppose. 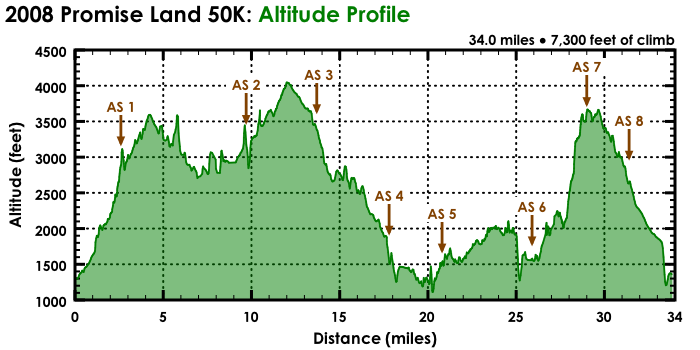 The first third of the race is mostly uphill as you make your way from roughly 1300' to just over 4000'. Then there's a good number of miles of pummeling downhill on steep single track and even a bit of road, flinging you headfirst into The Dark Side of the race. 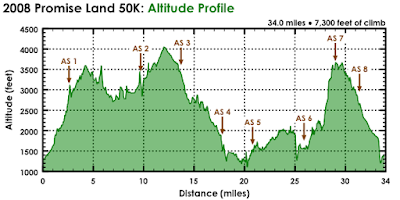 As you make your way to roughly the Marathon mark, you just hope and pray you've saved your legs enough for the brutal 3+ mile and 2000' climb AND the swift final 4 miles that sends you careening to the finish 2200' below. If you've trained right, if you bided your time in the first half of the race, you'll be rewarded with strong legs for the final climb and a swift stride down to the finish line at Promise Land Camp. If not, well, then it just wasn't your day! Personally, this race was also an affirmation of my acceptance into the Promised Land of Ultrarunning. My first ultramarathon was almost exactly one year ago -- The North Face DC 50 Miler last April. I went into that race under-trained and still trying to recover from a multi-month bout of PatellaFemoral Pain Syndrome (PFMS) ... who knew you couldn't rush from couch to Marathon to weekly 30 mile runs! I limped my way to the finish in 9:22. A year later, here I was, toeing the line at the Promise Land 50K, already having shaved 2 hours off my 50 Mile effort, having won my first ultra, and having taken the podium in my 2 previous races. PL50 would be my last of 5 ultras (+ 1 marathon) in 3 months. It would mark my transition from dipping my toes in the ultra waters to being a full-on legit runner, from a year of struggling and learning to a future of opportunities and accomplishments. I was hoping it'd be the final bit of racing confidence I'd need before heading off to Western States. I intended to race this bad boy all out, pedal to the medal. in the immortal words of David Horton, I was "STUPID!" In my training 2 weeks prior, I ran along with the Boston Marathon live coverage on my treadmill ... ONE WEEK after running a solid 50 Miler. STUPID! I was cocky and full of myself. I got bored with my casual 7-flat miles and after 20 miles, I said screw it! and kicked up the pace. I ran a sub-18:30 final 5K to finish in a few ticks under 3:00. If that wasn't enough, my treadmill belt got loose at the end, but instead of getting off and tightening it, I started stomping and pushing the belt into place while running sub-6 miles. STUPID! STUPID! STUPID! For the week and a half between that fiasco and Promise Land, my left femur and quads ached like crazy. I could hardly walk some days. Runs were pain-filled and limp-tacular. I even resorted to drastic measures and went a full 72 hours without running! I started the race off with a comfortable climbing pace, surrounded by a handful of C-ville / Crozet runners and Clark Zealand (all decked out in his spiffy Patagonia kit ... jealous!). I was pleasantly surprised that my bum leg only ached instead of sending stabbing pains through the depths of my femur and soul. I made sure to stay well within myself. I didn't climb too hard at the beginning and I was extra cautious on the downhills. Before I knew it, I was 12 miles into the race, crossing the Blue Ridge Parkway a few seconds back of Ryan Paavola, greeted by the uplifting sound of Horton's voice: "...and ... FIRST LOSER!" I was in 11th place. I just shook my head and shouted that I'd make sure to catch a few guys. "Be patient, some of those guys are going to die. Just be sure you don't die, too!" I know, Horton, I know! I flew through AS3, passing Clark and a runner I felt didn't belong up front. And just like that, I was in 9th! On the long descent to AS4 I hit some steep, technical single track and found myself running too aggressive ... bounding this way and that, and nearly running right into Ryan Paavola. He kindly offered to let the lunatic by, but I apologized and said I needed to dial it back a bit ... I had a bum leg to be mindful of. At one point, I got one of my Altra Lone Peak's soaking wet in a stream crossing and just like at Bull Run, the saturation caused my insole to slide around and fold over on itself, forcing my toes into a quasi-hammertoe position. It took an unnecessary amount of wriggling and sliding and pounding to work the insole back into place. I had worn the Lone Peaks instead of the Superiors for the extra bit of padding to protect my leg and I knew I'd run the risk of an insole slip. Going forward, I'll have to glue that sucker down if I run anything other than dry desert ultras with them. Making my way through AS4, I still found myself behind Ryan, but well within sight of him. I chased him along the painfully hard, paved road for 2 miles before jumping onto the trails of Colon Hollow. I had taken it easy on my legs, making sure to not overexcite myself earlier and give chase to Ryan, and I quickly found that I had a spring in my step when we got back onto the trails. I jumped past Ryan and began to make my way through the rolling single-track and overgrown double-track for the next 6 miles. I came upon another runner and just like that, I was in 7th. I was feeling good when I got to AS5 at Colon Hollow and was told that 6th was only "a minute up". Okay, it's clear my leg isn't going to fall off, so let's pick up the pace! I thought I had to be making up ground, and then I started to run out of steam. I had mistakenly thought that this section was flat with rolling hills, but in actuality it was rolling hills on an 800' pitch ... I was climbing from 1200' to 2000' in 4 miles AND running rolling hills. It wasn't long before my will-power started to go out the window. This was supposed to be the easy section! I'm supposed to be strong and making up ground here! I kept looking back as I skirted along the densely forested hills ... at least I can't see anyone behind me ... I've got to be increasing my lead over everyone behind me. At one point I reached for my 4th and final gel in my pocket to find it wasn't there. Did I eat it already? Did it fall out? Did I even have 4 gels to start the race? Am I losing my mind?! When I hit the 200m out-and-back section of trail that led down to AS6, I was hoping to see 6th place. Instead, all I saw was whole bunch of 'nothin. Ugh! And to make matters worse, coming back out of the aid station I passed by FOUR runners -- John Andersen, Clark Zealand, Ryan Paavola, and another runner I didn't know but he looked mighty fresh. Seeing those guys was like a punch in the gut. Great, I'm running out of energy and instead of growing a lead over the past 5 miles, there's FOUR runners right on my tail and at least three of them scare me! Keeping Top Ten suddenly felt impossible. And to boot, John looked like he was on a mission -- "I'm coming for you and your broken leg!" 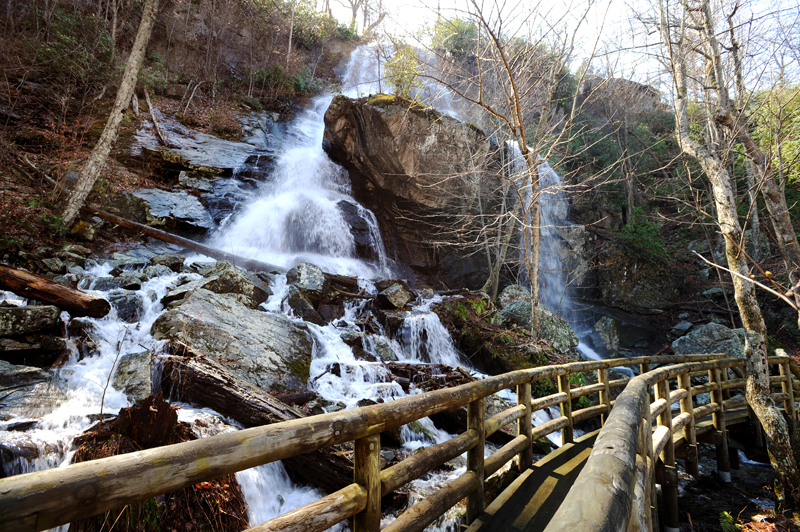 I frantically tried to keep running as I began the steep climb up past Apple Orchard Falls, but all that work felt futile. I was quickly passed by the mystery runner ... he was booking it! I thought that at any moment the other three would roll past me. I felt sapped of energy. The panic and fear of getting steamrolled by a hoard of hungry runners was a competitive feeling I'd not felt since high school. I loved it momentarily, and then hated it the rest of the race. My legs were limp noodles, not high octane pistons. I thought that calories would help so I tried out the Picky Bar I had in my pocket for just this circumstance. I'd never tried Picky Bars before, but figured they sounded good and was hoping to try them out in a race environment. One bite ... my mouth filled with saliva ... and the taste of iron. I tried to choke that single bite down, but it wasn't happening. So much for that idea! (Post-race I ate the rest and it was delicious ... go figure). Then my stomach started to turn. I frantically pulled out my ziplock bag of TP and started searching the side of the trail for a place to go digging in the dirt. I'm running out of steam, there's 3 guys right on my tail, and now I'm going to lose 5 minutes going to the bathroom. Fan-freakin-tastic! Luckily, my stomach settled and I never needed to stop. By some miracle, I finally made it through the gauntlet of way-too-steep steps, past the waterfall, and up to the final AS, but I honestly couldn't say what the scenery was like on the way up. I hear it's beautiful, but I was busy hunched over, staring at the ground, hoping my legs would keep pumping. I wouldn't know ... I was too busy contemplating collapsing into a heap and weeping like a little baby. I passed through the final AS and stumbled my way to the top of the climb. Then, the cramps kicked in. Fantastic! I hadn't experienced cramps in my previous 4 races this spring, so it was clear that something was up with my legs. My right leg was the worst, likely from slightly overcompensating all race to protect the bum left leg. I stopped for a moment to stretch out. Then I stopped for another moment. Was I going to survive this race at all?! "Oh don't do that!" John had caught up with me as I was stretching out my quad cramps and offered up some sage advice. I started to run with him but it was clear I wouldn't be able to keep up. After a few minutes of chatting, he ran on down the trail. I, on the other hand, limped along at pedestrian pace ... And then I bit it! My leg threw a cramp mid-stride and I was flung headlong onto the trail. After a quick roll and pop-up, my legs surprisingly felt better, probably from a quick shot of adrenaline. I picked up the pace as I careened downhill along the final stretch of single track. As I popped out onto the road to the finish, I could see John in the distance. I picked up the pace to the point of pain, but not hard enough that I was going to blow out my legs. I had really wanted to run in the neighborhood of 5:30 miles on the way down, but that wasn't going to be happening today. I kept my eyes fixated on John as I flew down the mountainside at 6-flat pace, breathing calmly, and ever mindful of my weakened legs. 10 seconds back ... still 10 seconds back ... still 10 seconds back ... I'm gonna catch you! 15 seconds back ... One Mile To Go! ... 20 seconds back ... Cramp! Cramp! Cramp! ... There's someone behind me?! How the hell did that happen? Just dig deep ... Almost there. And finally ... there it was ... The Promise(d) Land! I ended the race firmly in 9th place with a time of 5:15. Except, well, actually, it was 8th place! The would-be 2nd place runner took a wrong turn after cresting the final climb and ended up retracing an earlier section of the race ... his loss, my gain. While I was 15 minutes off of my original goal, I was only 5 minutes back of my pre-race adjusted goal of 5:10, and more than all of those 5 minutes were lost on the final climb and descent. At the end of the day, it was a solid effort that I could hang my hat upon. I was nowhere near 100% physically, yet I stayed within range of many runners I'm now beginning to consider my equals and no longer those lead guys waaay up ahead. And I snagged a Top 10 to redeem myself from Holiday Lake ... with some sweet Top 10 swag -- an insanely comfortable Patagonia hoodie (I always need a new hoodie!). It was an incredible race and an amazing experience. I can't wait to come back next year -- healthier, stronger, determined. ... and now it's time to go see a doctor about that leg!